Both offerings within Chalet Vache Bleue are architecturally designed, fitted and furnished to a high standard. Whilst the exterior of the building was designed to reflect the Barn it once was, the interior is chic, spacious and comfortable. Chalet is fully self-contained with a private entrance. The Chalet is designed to provide a family or group of friends with a private boutique style experience. High on creature comforts such as beautiful bedrooms with en-suite bathrooms. Spacious living area with leather sofas, TV/DVD, Bose sound dock, WiFi, ample radiators and a fire. Chalet Vache Bleue is a place you will be happy to call home and a great place to rest after a day in the Alps. Practical considerations have not been forgotten either; comfortable beds with fully sprung mattresses for the perfect sleep, built in wardrobes in every bedroom, plentiful supply of hot water, a drying room and washing machine. The Chalet has level access from the street to the ski storage area avoiding the need to carry equipment up or down stairs. Your boots will be toasty warm in the morning thanks to the Boot Heater. The large kitchen is fully fitted and equipped; opening onto the dining area to ensure those busy preparing meals are not excluded from the social side of the holiday. If cooking is not your "thing" we can source a Chef to come and look after or you can book Chef standard meals which are delivered to the Chalet daily for you to heat and serve when convenient for you. Enjoying some extra Apres Ski time or browsing the shops in Meribel without worrying about getting home for a specified Dinner time is exactly what a relaxing holiday is all about. Eating out is also an option with several restaurants in Les Allues and many more in the resort centre at Meribel. We are happy to make reservations at restaurants for you. Flexibility is key to a great holiday and a self-catered holiday at Chalet Vache Bleue can give you that flexibility. The Chalet was designed to be suitable for longer stays, we did this by ensuring the facilities and comfort level meant you really could settle in for a few weeks. Many of our guests stay 2 - 5 weeks rather than the traditional one week so we feel we have achieved that standard. Having said that if your stay is for the traditional one week period we will do everything we can to help you make the most of every minute. The Chalet will be warm and sparkling clean for your arrival, beds made and basic kitchen provisions supplied. We can help you arrange for hire equipment to be waiting at the Chalet, lift passes can be arranged, they will be waiting for you on arrival and up to date local information will be prepared for you. It is rare to find alpine accommodation of this standard at such a reasonable cost and available as self catered. Andrew and Elaine live in Brisbane Australia. They have skied Les Trois Vallees since 1992. We bought Chalet Vache Bleue as a ruined "Sheep" fold and spent 5 years rebuilding to a modern mountain home. We value the expertise of an Architect and employed a Lyon based Architect to design and project manage the reconstruction to cutting edge standards. After 8 successful winter seasons at Chalet Vache Bleue and take great pride in the fact that not only do many of our guests return but they return for periods of greater than the typical one week ski holiday. We feel we have been successful in creating a mountain base which guests are very happy to stay in for as long as they can! We pride ourselves on delivering a personal service from your first enquiry to your arrival at the Chalet. Les Trois Vallees are the largest and most varied hi altitude ski/boarding area in the world with over 200 lifts, more than 600km of pistes and unlimited off piste. All abilities from beginner to fearless extreme thrill seeker are catered for. Meribel is not far from the border of France and Italy and the area has a rich history, and is famous for great food and wine. Burgundy is not far to the North, the Rhone Valley vineyards are a short drive. Several of the famous climbs on the Tour de France are less than hours drive with Courcheval being less than 5 minutes and Col de Madeleine around 20 minutes away. We wanted to run a ski business in a "real" French Village rather than a purpose built ski resort, we believe we found the perfect place in Les Allues and we think you will agree. Spacious chic Chalet in a perfect central village location. The property is very convenient for both the gondola which takes you to the heart of the resort and the free ski bus. Restaurants and bars are a short stroll at the end of the day. Our property is fully equipped for a luxury break in the mountains, with fully equipped Kitchen, Neff Appliances, Bo Concept leather sofa, oversize bedrooms and comfortable beds to mention just a few highlights. We have rebuilt using the best materials including Oak for staircases, floors and doors. Our electrics and hot water system are also cutting edge so no risk of of a cold shower or cold feet for sleepy heads. Artwork is chosen with an eye for the mountain. We hope your stay at Chalet Vache Bleue sets a new standard for accommodation in Les Trois Vallees Savoie. Egyptian cotton linen, beds made up for your arrival. Drying room to dry off your outdoor wear or washing. Access to Boot room with boot heaters, ski/board storage. Level entry, no stairs to negotiate carrying skis or wearing boots. Secure Bike storage. Close to free parking in Village. On site garage available for €50 per week, please enquire for availability. Small on site garage available for some weeks at €50 per week, please enquire for availability. Free parking is available in Les Allues. Level 1: Open plan living, dining and kitchen. Bo Concept Leather Sofa, 140 cm flat screen TV with Freeview channels and French TV, DVD player, iPod doc, WiFi, wood pellet burning fire place. Basics to get you started when you arrive plus a range of herbs and spices. Kitchen is fully equipped with high quality matching crockery, cookware etc. The Three Valleys area is the largest high altitude ski domain in the world, offering you more than 600 km of groomed runs plus extensive off-piste terrain all accessible via 200 lifts. Meribel occupies the centre valley within the Three Valleys giving you easy access to the entire area. A true Ski Mecca, there are runs to suit every level of skier/boarder and lots of activities for non-skiers. The Ski area is snow sure thanks to the Northerly aspect, more than 70% of skiable terrain above 2000m and an extensive network of snow cannons servicing the area. The Gondola lift at Les Allues takes you to the central lift network at Meribel giving you direct access to the whole area. There is also a free regular bus service to Meribel centre. Both the bus stop and Gondola are within easy walking distance of Chalet Vache Bleue. The bus stop is a 4 minute walk and the Gondola a 10 minute walk. The "Village" piste from Meribel is open when snow conditions are good and ends in Les Allues. Méribel's 18 hole course is arguably one of the most beautiful courses in the Alps. It winds along the wooded slopes beneath Dent de Burgin, the valley's landmark, from Rhodos via the Altiport and down to Chantemouche, over nearly 1 000 feet vertical drop. Par 71 - Length: 5 538 m (6 056 yds). Practice area: a large 1100 m² (11 000 sq ft) putting green de 1100 m²; a chipping green, a bunker; a 40 station practice range, of which 10 covered. Open from 1st June each year. Additional information: Architect designed, contemporary Chalets recognised by Label Meribel accreditation. Both Chalets are beautifully furnished, fully equipped and occupy a central position in Les Allues. The Chalets have been designed with longer stays in mind we have guests who have stayed more than 6 weeks. The village is a thriving alpine community with a small supermarket, Gondola lift connecting to the central Meribel lift network and free ski bus. When conditions are good it is possible to ski back to the Village via a red piste. Prices include luxurious bed linen, beds made for your arrival. Fluffy towels, quality toiletries, bathrobes and slippers are provided. Each bedroom is located on a separate floor with private en-suite bathroom. Pre-arrival cleaning and end of stay cleaning. Free wifi for you to connect your own device or laptop. Electricity and water. French tourist tax. Catered options at additional cost are available, contact us for further information. Limited garage parking is available at €50 per week, please inquire about availability. The Chalets are non-smoking. Beautiful chalet and incredible hosts! 100 stars! The hosts were amazing and very accommodating. We would had the best time at the chalet. Andrew and Elaine were extremely helpful and we had everything that we needed. They helped us prior to our trip with transfers, ski lessons and transfers. This made us very relaxed and the planning easy. When we arrived they welcomed us with wine and chocolates. They also bought a birthday cake for one of our party, which was a very special touch. It was a perfect villa for 3 couples to stay in and each floor allowed more than enough space for us all. The chalet was extremely clean and beautifully decorated. The boot room and garage is excellent for holding all of your skis. The location of the chalet is 5 minutes from the bus stop that takes you to Meribel town centre. There is also a bubble ski lift 2 minutes walk from the bus stop. We loved our stay at the chalet and would definitely return. Thank you Charlotte and friends for your kind words and for being such great guests we enjoyed having you to stay. We are a group of 6 who have just returned from a perfect 5-night stay at Chalet Vache Bleue. The chalet is even more beautiful in real life and everything has been done to a very high standard. Andrew & Elaine are truly wonderful hosts and go the extra mile to make sure that guests enjoy their stay. The location of the chalet is also ideal, it is so close to the ski bus which is just a short journey into Meribel centre. Les Allues is a lovely town with some great restaurants (which were delicious and much more affordable than eating in Meribel centre). We would all recommend a visit to Chalet Vache Bleue in a heartbeat. Thank you Katie for taking the time to write such a lovely review. As owner-operators we are delighted when guests appreciate not just the Chalet but also the small touches we add. It was a pleasure to have you and your friends to stay and we hope to see you again at some time. Its better than the pictures! Thank you Jackie for your kind review. Having spent many years taking snow based holidays we know that the tiny details can really make a difference. We are delighted that you enjoyed your stay and look forward to seeing you again. Situated in the village of Les Allues and a short walk to the Bus or Gondola this chalet was in immaculate condition. The building has been carefully refurbished and the pictures of 'before and after' show the quality of the craftsmanship that is evident. We were a group of 6 adults and each of the 3 well sized bedrooms were en suite.The Kitchen was extremely well stocked with all necessary cooking utensils and the quality of the furniture throughout the chalet was appropriate to the description. Andy was there to greet us on arrival and had plenty of helpful tips for the week ahead. We will definitely return ! Thank you Liam for taking the time to write such a great review. We loved having you all to stay and look forward to seeing you again. Very well located and equipped Chalet, loads to do with the kids, and a great hostess. Thank you Hugh so happy to hear the Chalet met your expectations and helped to make your holiday great. Despite the weather on some days you certainly all got out and about and yes the Alps in Summer really does have so much to do. The description of the chalet was accurate regarding the location, layout and facilities. The beds were extremely comfortable and the whole chalet was spotless and very well maintained. Andrew and Elaine could not have been more helpful and I would definitely recommend this chalet and return to it myself. Thank you for this review - very kind words. Again our guests are rating Chalet Vache Bleue very highly and we are delighted that so many wish to come back. We will continue to improve our property and ensure our services go well beyond expected norms. If you are interested in a Cycling holiday in Meribel contact us and we can put you directly in touch with local operators who we work with. The entire area is also well served with signed and maintained walking paths offering a truly unique way to see the beautiful French Alps. The closest airports are Chambery approx 1.10 hour drive, Geneva approx 2 hours drive and Grenoble approx 2 hours drive. There are many companies who offer both private and shared transfer services from these airports. Moutiers railway station serves the Three Valleys Ski Resorts with fast TGV and Eurostar Train Services direct from the UK and Paris. There is a bus service from Moutiers to Les Allues and also companies who offer private transfer services. Contact us for further information. 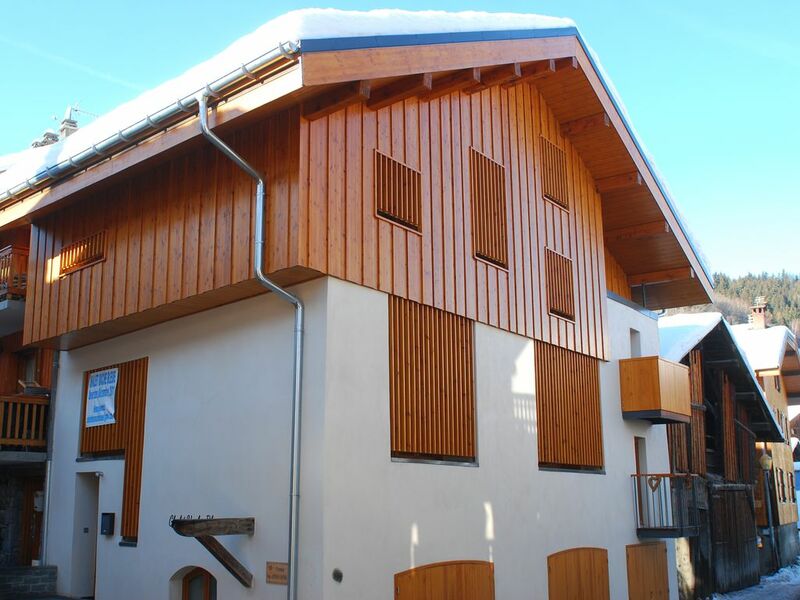 The Chalet is in the centre of the village approx 4 minute walk to free ski bus, an easy 10 minutes walk to Gondola. Meribel Village can be reached by car in 5 minutes where there is free parking and access to the pistes via the Golf lift. Meribel centre can be reached by car in less than 10 minutes, Mottaret 15 mins. All the facilities of Meribel centre can be enjoyed via the ski bus which runs until after midnight during the season without the need to be based in the busy centre itself. Les Allues is the original village of the Meribel area and makes an ideal base for you to enjoy the very best of everything the three valleys area offers. Les Allues offers a peaceful and traditional environment, having several excellent restaurants, two bars, ski shop, a small supermarket which provides freshly baked bread and pastries every day, a Post Office and an ATM. Whilst Meribel is a mecca for ski enthusiasts there is plenty for non-skiers including Spa Treatments, Snow Shoe walking and simply discovering the many villages of the valley. Booking Notes: Usual changeover day is Sunday. A booking is effective when a deposit of 400 Euro for Chalet A or 200 Euro for Chalet B is received. The remaining holiday cost plus Euro 400 is due 8 weeks before the beginning of the stay. For bookings made less than eight weeks before commencement full payment including the security deposit is required. Changeover Day: Chalet A Sunday. Check in 4.00pm, check out 10.00am. Chalet B Saturday. Check in 4.00pm, check out 10.00am. If you have an early arrival or late departure we can store luggage for you. Notes on prices: Chalet A - Available Winter/Summer. Prices are for 7 nights, short breaks may be available. Some off-peak weeks have special prices if you are a party of 4 and only require 2 bedrooms. See our web site for details. Long stays attract a discount. Chalet B will have limited winter availability, if you are interested and have a week in mind contact us and we will see what we can do to assist you. The price of 625€ applies to non-peak weeks. The price range through the season is from 625€ to 900€.